We’re currently offering a deal for $20-60 off of a tuxedo. To redeem this deal, print out the coupon below. Note: Not available with any other offers. Not valid on the entry-level tuxedo, same-day service, or hotel delivery. 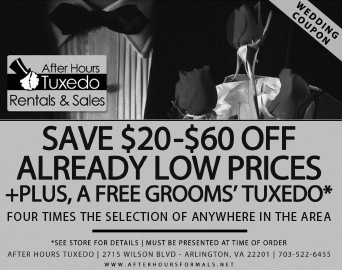 This special includes a free tuxedo for the groom, please call or visit the shop for complete details. A $40 deposit is required for the groom’s tuxedo at reservation and will be refunded upon pick-up. We currently carry a previously-worn, three-button, designer tuxedo including coat and pants for $179. Please stop by or call for availability of specific sizes.